Okay, now I'm back to Makassar again. The purpose is for the national election, I can't use my rights to vote If I were in Jogja. So then my father decided to send me some money to catch the latest flight from Jogja to Makassar. Unfortunately there weren't left any plane from Jogja to Makassar. So, I chose to take the flight from Juanda Airport, Surabaya, since it cheaper and a lot of planes going around Surabaya-Makassar. After spent a day in my uncle's house at Bantul, I went to Surabaya at night by a travel. My journey from Jogja to Surabaya is a harsh one. I sat on the corner, very corner. People who sat beside me is a big yet so dark man with unbelievable smell. He lift up his feet at the seat right beside me and spread junky smell ever which contamined my senses of smell. Beside that, the driver acted like he was possessed by a professional F1 spirit or what. I can't barely sleep at all. When we arrived at Juanda Airport, I felt so relieve. 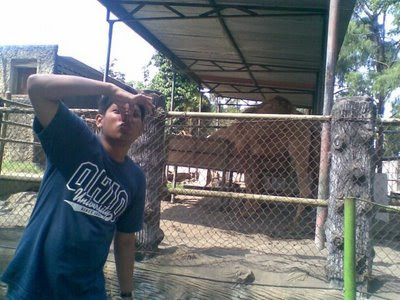 A day before, I went to Gembira Loka Zoo with Kak Icha and some of her fellahs. Two days ago, Kak Asni treated me ate 'Bebek Goreng'. Yummy, my life is so wonderful. What happened during my journey back to Makassar seemed like the vice-versa. The world is not just enough for me.